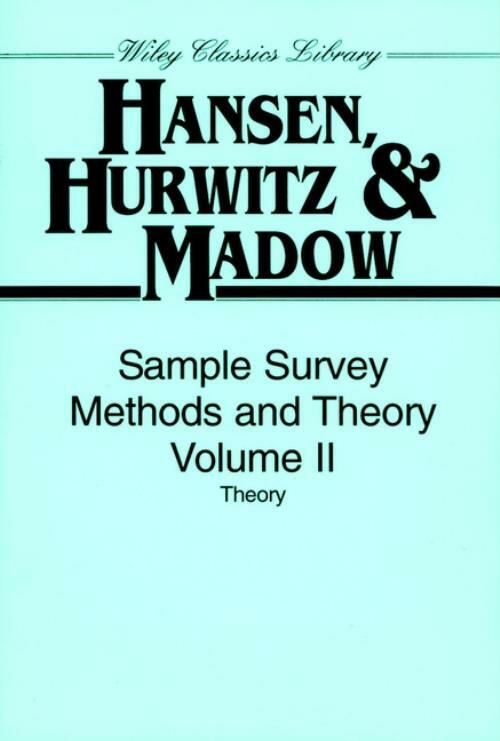 A general purpose work on sampling method and theory. Volume 1 gives a simple, non-mathematical discussion of principles and their practical applications. Volume 2 covers theory and proofs. Random Variables, Expected Values, Variances, Covariances, and Convergence in Probability. DERIVATIONS, PROOFS, AND SOME EXTENSIONS OF THEORY FOR CORRESPONDING CHAPTERS OF VOLUME 1. Simple One– or More Stage Cluster Sampling. Stratified Single– or Multi–Stage Cluster Sampling. Control of Variation in Size of Cluster in Estimating Totals, Averages, or Ratios. Multi–Stage Sampling with Large Primary Sampling Units. Regression Estimates, Double Sampling, Sampling for Time Series, and Other Sampling Methods. A THEORY FOR RESPONSE ERRIRS.